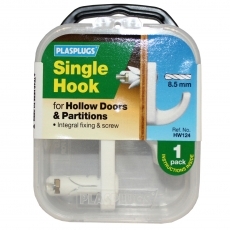 1 x Hollow Door Regular Duty Single Fixing Hook for use in Hollow Doors, Thin Skin Partitions, Plywood and Fibreglass. Ideal for the home, boat and caravan. Integral fixing & screw. Comes with drill guide. 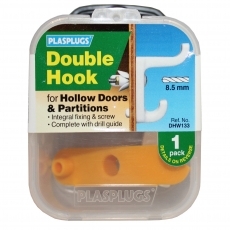 1 x Hollow Door Regular Duty Double Fixing Hook for use in Hollow Doors, Thin Skin Partitions, Plywood and Fibreglass. Ideal for the home, boat and caravan. Integral fixing & screw. Comes with drill guide. 2 x Double Solid Door Hooks White. Fix direct to solid wood surfaces, or fix into solid walls using plasplugs Originals General Purpose Mutli-Fix fixings.